British and American tour operators take visitors to Italian gardens. The alternatives are car hire, which is easy, and public transport, which is cheap and extensive. There can be long hot queues at ticket windows in Italian stations but many stations have automatic ticket machines with instructions in several languages. They look intimidating but are surprisingly easy to use. Driving in country districts is relaxing and easy. Driving in and around the big cities of Italy can be a nightmare: heavy congestion, confusing road signs and hot tempered drivers. An air conditioned car helps. Discover the beautiful gardens of Southern Italy including Villa Rufolo and Villa Cimbrone on the Amalfi coast, La Mortella on Ischia, Naples Botanical Gardens and La Caserta just outside Naples. You also have the option to visit Pompeii and Herculaneum. 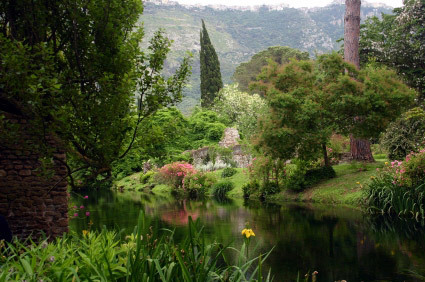 This tour includes the two best-loved gardens in Italy ( Villa d’Este and Villa Lante) and a charming botanical garden outside Rome (Ninfa, pictured left - image copyright Daniele Muscetta).